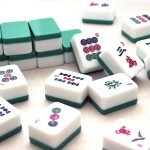 Old Palm Golf Club | Old Palm News - Are you game for a little Mahjongg? Are you game for a little Mahjongg? The ancient game of Mahjongg is experiencing a rebirth, especially at Old Palm Golf Club. Every Monday and Wednesday, a group meets in the Ladies Lounge to play the popular rummy-like game that uses tiles instead of cards. The competition is fierce but friendly, and anyone whoâs interested is welcome to join the fun. Mahjongg, or âMaajh,â as it is often called, originated in China supposedly around the time of Confucius in 500 B.C. When it was finally introduced into the United States in the 1920s, Mahjongg became an instant sensation. Itâs still incredibly popular, and whether you win or lose, itâs always a great way to pass the time with friends. So drop by the Ladies Lounge and try your hand at Mahjongg.